Years ago, I listened to a song by gospel artiste, Ray Boltz. This was fifteen years ago or thereabouts. The song, “The Anchor Holds”, became a kind of anthem for me. It was a tonic and one day, inspired by it, I sat behind an Olympia typewriter in my department’s general office and tapped out a short piece which I pinned to a board in my office. You know sometimes you just have to encourage yourself in the Lord when you are being buffeted by life. You may not always have people to speak hope and strength into you but you can do it for yourself or rather to yourself. I wrote it in the first person plural though so that others who read it will be uplifted as well. I want to share that piece with you today. It’s not a theological document that answers any deep question about suffering and the Christian perspective to it. It doesn’t even quote Scripture directly except in the penultimate paragraph but it encouraged me and I believe it will do the same for you. I also picked up a couple of lines from my recent poem, “Thank You, Lord!” for the accompanying graphic which I hope will fortify your heart. You might want to take a moment to give your life to Jesus if you haven’t done so to enable you appropriate the blessing in the passage. You are blessed! Life is not a bed of roses. There are challenges along the way. Sometimes, it seems as if the ship of our lives will capsize. At other times, it looks like our entire lives are coming to an end. Yet, we should never give up. We should continue to believe that God cares and He will never leave us desolate. Our lives are like ships and the Lord Jesus is the anchor. Though the sea may rage, though the winds may howl, He remains unshaken and through Him, so shall we. No matter what comes our way, Jesus our Saviour is able to see us through. He is able to bring us out of it all unscathed, even enriched, for it is true that “all things work together for good to them that love God, … who are the called according to His purpose” (Romans 8:28 -KJV). So when temptations and trials come your way, when it seems like there’s simply no way out, remember it is not the end of the road, for the anchor holds. Always, THE ANCHOR HOLDS. Thank you, dear! Will check your site. Whao,madam your write ups are wonderful and give hope when life seem nothing to individuals.Thank you for inspiring people and may heaven embarass you with unquantifiable desires of your heart. Thanks for the kudos God bless you richly, Joe! Glory to God! Thank you, Lawrence! You are set for exploits in Jesus' name. Thank you too. You are blessed! Yes, when the billows rise, our Anchor holds strong. The song was a big blessing to me way back. I'm glad you we're blessed by my recollections. Shalom! God bless you ma, this is truly inspiring. God is the anchor that holds my live even when the storms of life comes my way he still remains my anchor. Yes, He does, 'cause He's a faithful God. God is jst d pilar to our success so no matter wat we should hold on to our faith in Him. This reminds me of an old Christian song. I hadn't thought of it in years! It's a beautiful one indeed, Tara! You ate richly blessed in Jesus' name. It's a beautiful one indeed, Tara! You are richly blessed in Jesus' name. Nice, Vickie! God speaks peace and comfort to us in various ways. He does that a lot for me through songs. Glad you were blessed by this. Hopping over to visit you now. It is well with you in Jesus' name. ?? HOPE! HOPE!! That the anchor holds, always, in God, is the foundation of hope in our lives. Without which SUICIDE would be a virtue; a Priceless way out of misery. Yes, as children of God we are to put God first in all that we do. 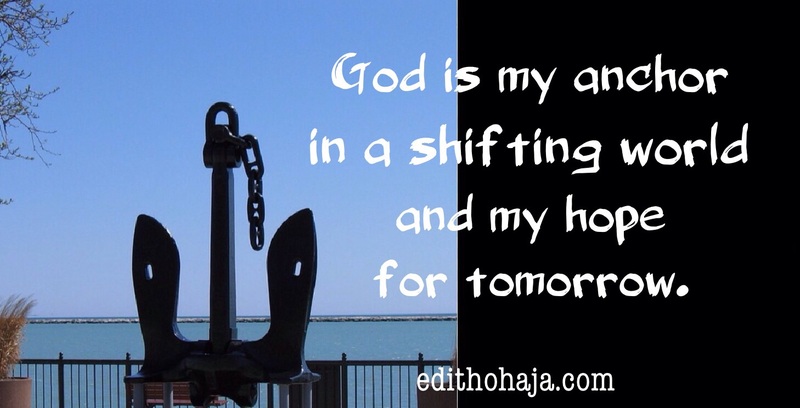 that is the only way he can be our anchor because he does not force his way into our lives. but if we accept him wholeheartedly, then we are in safe hands. no matter the wind that may blow, he will never forsake us. My anchor holds!! ma you dont know what u've done for me. Glory to God! He did it and He knows! Stay blessed, my dear! God is the reason for our being, the anchor to our soul. Wonderful one ma. Surprising how sometimes, little things can inspire us to do great things. I agree with you ma, the Anchor holds no matter the circumstance. The Lord alone is our anchor, our rock that never fails. I love that you never fail to talk about the love of God and how he expresses it to us everyday ma. Very lovely piece. Nice one. Our Christian race is not one of fear but of hope and faith in the unwavering ability of God to deliver us from all our troubles. Our Anchor will sail the ship of our lives to a safe place. Let us all endeavor to believe and trust in Him. YES! There are lot of challenges we human face in this world of different stages. The ANCHOR is Jesus for He knows how to hold us in those difficult situations. My Anchor is Jesus and that is what Aunty Edith has tipped to me; to tell that tough situation and stress- My Anchor is Jesus. Jesus my anchor! I trust in you..with you on my side.. My fears of earthy worries are gone.. Yes the anchor holds and in him do I place my hope and my life when trying moments come in him do I look up to. Beautiful song. I love when a song is encouraging to my spirit. Especially when I’m in need of it. Like you mentioned, they become anthems. Praise the Lord for the gifts He puts in His children to bless one another. Yes the Anchor holds.... In our everyday life filled with torment and regret, He is still with us trying to strengthen us to stand firm. God is indeed lovely!!!! When it seems like there's simply no way out, the anchor holds. This write-up has touched me and I feel really blessed and encouraged by it. God is good all the time. God is the steadfast anchor of our live, who sees us through difficult moments. Our lives are truly like ships about to capsize but God is always there to hold unto us. This just clearly shows that without God we are doomed to fail.